Special Thanks to Miles Lourie, Clive Davis, Michael Devereaux, Sue Walsh, Karl Ellis, Jerry Sosnik, Lynn Rowland, Jim Foxworth, Laurie Saperstein, Randel Porter, Rose Marino, Lou Genetti, Glenna Duffy, Harry Grovier, Skip Surowiec, Garry Kief, and of course Linda and Bagel. Great songs on this album. Bad hair–great songs. The album cover was done in black and white. It makes sense, too, because I was going through what I call my “gray period,” and I was feeling introspective. I wrote a song with Enoch Anderson about a divorced father who sees his child on weekends, called “Sunday Father,” and another with Bruce Sussman and Jack Feldman – “You Could Show Me” – about being brave enough to ask for help. “Ships,” written by Ian Hunter, was another intimate song about parents, and “Where Are They Now” is a wonderful song by the talented Richard Kerr and John Bettis about missing old friends. And, of course, “One Voice,” which came to me complete in a dream one night (really! ), is one of my proudest creations. The bonus cut on this reissue is “They Gave In To The Blues,” with a wonderful and wise lyric by Marty Panzer. 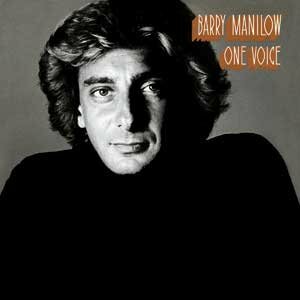 “One Voice”, 1979 Kamakazi Music Corp. (BMI); 40 Background Voices sung by Barry Manilow! “Sunday Father”, 1979 Kamakazi Music Corp. (BMI), Catapult Music Co.